Taylor Ann Tye found herself sitting in a circle with fellow Indigenous people for the first time since finding out about her heritage two months ago. The circle consisted of nine women and one man, all ready to learn the art of moccasin and mukluk making. Stitch by stitch and bead by bead. Tye, who identifies as Ojibwe on her mother’s side and Métis on her father’s side of the family has been searching for a way to tell her story. “I needed a circle to be a part of to hear everybody else’s stories so that I can understand my story,” Tye says. 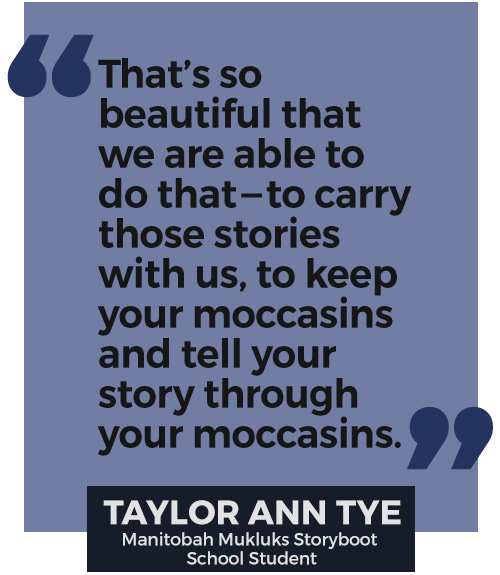 Tye says she’s found that circle at the Manitobah Mukluks Storyboot School which has taken up semi-permanent residence at the Bata Shoe Museum in the heart of Toronto. Every Sunday afternoon for six weeks, you can find a group of Indigenous youth spending time together, sitting in a circle, stitching and beading shoes but also weaving new relationships. Guided by instructor Stephanie Pangowish, Sunday afternoons are for crafting, connecting and collaborating through an exchange of culture. Another student, Brittany who asked not to share her last name, says that she found the opportunity to make moccasins and learn a new pattern is a way to reconnect with her Ojibwe roots. Like her classmates, Brittany begins by tracing her feet, measuring and then cutting sueded leather. She then cuts the vamps which sit on top of the foot, where the beadwork will be added. The moccasins will be lined with non-traditional false-fur but will be topped with rabbit fur around the ankle. The moccasins taught in these classes are unique to the instructor because the construction of the moccasin depends on region. Pangowish teaches her students the pucker toe, which is the way she learned it. They are different from Pow Wow moccasins because they do not have to have traditional beading. The classes are geared towards youth – people ages 13-28. If not enough young people sign up, then people of all ages can join. That was the case with Erin, who asked not to share her last name. She recently discovered her family was of Indigenous heritage and had come from Newfoundland. She has not been able to work for 17 years due to health concerns but she saw this class a potential to support her family. “Finding the school [Manitobah Mukluks Storyboot School] was like a gift wrapped up for me,” Erin said. Moccasins were originally made as protective footwear. Moccasins were made according to the environment the person lived in. For example, moccasins made for the Plains group located in the southern parts of Manitoba, Saskatchewan and Alberta would wear hard-soled moccasins because of rocky terrain. The moccasins also had a turned-up toe to prevent from sharp objects piercing the foot. The Bata Shoe Museum ran an exhibit in 2013 called Beauty, Identity and Pride: Native North American Footwear which displayed Indigenous footwear. The exhibit walked through Indigenous history, culture and geography. The moccasins have a greater function than just for walking. They show evidence of trade, status as well as regional and cultural identity. Explore Erin’s moccasin vamps (the top part of the shoe), the beading and what the pattern means to her. Sheila Knox, head of education and programming at the Bata Shoe Museum says she finds that the millennial students design their vamps with mainly non-traditional designs. “Pretty much all of the Indigenous youth are not doing a traditional design at all. They can choose their design and they do modern looking things. It evolves. The construction of the moccasin is traditional but it evolves with the generations and it shouldn’t be stuck in 19th century times,” Knox says. Brittany, when drawing her flower design for her vamps, finds that they are not entirely symmetrical. “If the Creator wants it that way, then it will be that way,” Brittany sats. Between the cutting, measuring, designing and beading, art is created but so are new stories, as well as the exchange of history. Tye is decorating her moccasin vamps with her story. The left foot will have a mountain range. She has a tattoo of a mountain range with a train going East, through an amethyst mine on her shoulder. Just below are the lyrics, “Who found lady from the mountains” from the Stevie Nicks song, Sorcerer. The right foot will have the East Coast, with a lighthouse, trees and the Northern Lights above. “Because that’s my home, I am born of Earth, Air, Wind and Fire. That’s all I need to know. Houses are just bricks and mortar, this earth is our home and we need to learn that more than anything,” Tye says. While the Bata Shoe Museum provides living artists an institutional space to display their art as well as teach classes, displaying art is not part of Indigenous traditions. Tara Barnes, a spokesperson for Manitobah Mukluks, believes that the museum straddles the lines between being an institution but also a creative space. “We are doing living art, with living people who are really benefitting from it and evolving the craft for the future and then teaching it to other people so it stays alive,” Barnes said. The atmosphere is during class is raw and vulnerable but also open and accepting. It is learning a lost life skill to preserve culture and art. The class is even more so about intimate relationship building while practicing the patience of learning a new craft. “It’s absolutely one bead at a time, and one person at a time,” Barnes said. Indigenous Land, Urban Stories is a project by master’s students at the Ryerson School of Journalism with support from Journalists for Human Rights (JHR). JHR’s Indigenous Reporters Program broadly seeks to increase the quality and quantity of Indigenous voices and stories in Canadian media. Indigenous Land, Urban Stories was developed and designed by Lindsay Smith and Sally Goldberg Powell of the Ryerson School of Journalism.